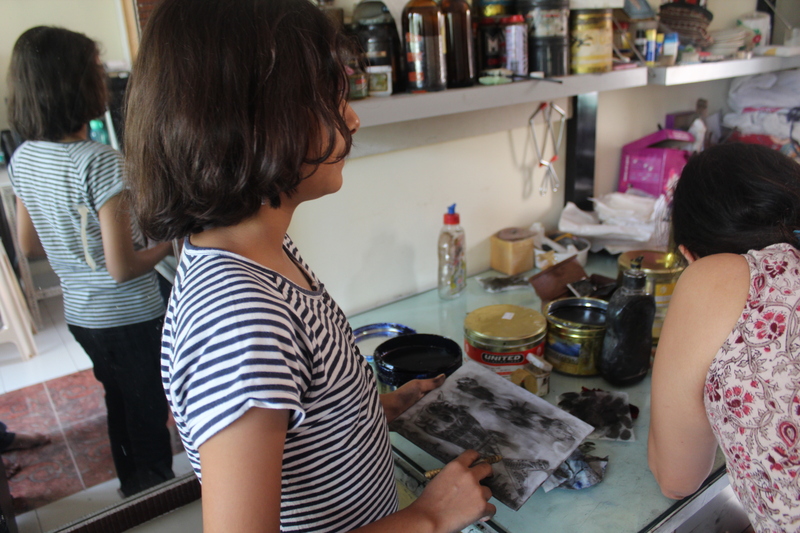 Over a span of 2 sessions, Tanujaa Rane worked with the children to delve further into the art of dry point printing. The crux of making good dry point is being able to scratch effortlessly on the given sheet (in this case Plexiglas) and so character and rendering took center stage. The students drawing were more complex than they were during the first part of the workshop. Tanujaa fuelled their thinking by encouraging them to share their ideas and thoughts with each other . She gave them ideas as to how they could make their sketches more innovative. see which one’s personality best reflects their own. The kids delved into their own psyche to figure out what best suited them and what they would be most comfortable drawing. All the final plates were influenced heavily by nature and evolution. After making the basic outline of their design on the plates, the students began rendering to create texture, light and dark, and shadows. They explored the various methods of scratching (curly, cross hatch, wavy lines) and the effect of increasing and decreasing the pressure of the needle on the plate and what the resultant outcome would be. As Tanujaa explained that the process has more to do with the overall feel and texture of the plate than about the design itself. The focus of the project was on the style of rendering and being able to understand yourself better. The final artworks were a set of quirky, character revealing prints.